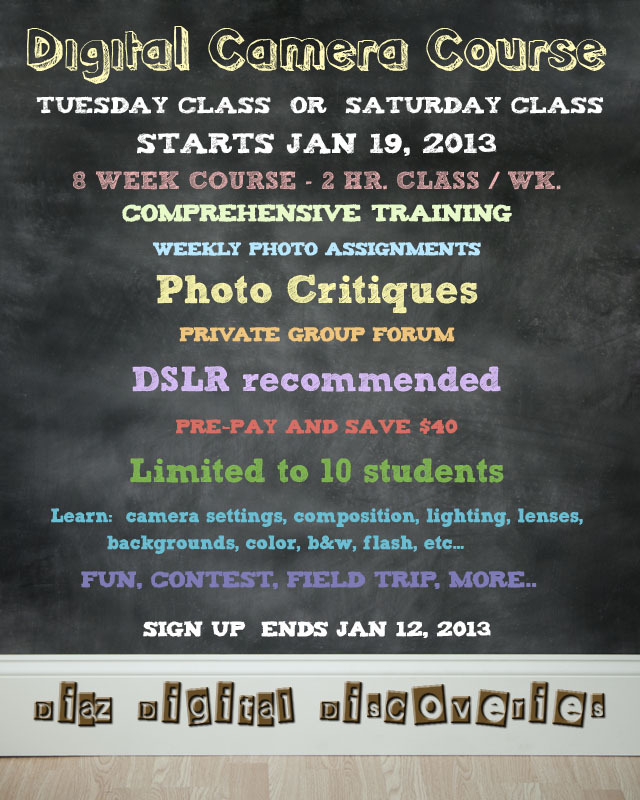 Beginners Digital Photography Class – Choose Tuesday or Saturday Classes! Due to the increase of people interested, we have now added a second class on Tuesdays at 11am. So now you can take advantage of our digital camera course on either Tuesdays or Saturdays. If you can’t make it to our Saturday classes because of your schedule, sign up for our Tuesday classes. We are excited to be adding this second class, so that more of you can enjoy it. Hurry! Sign up now for either day! Seating is limited, so to reserve your seat for this class, you must pre-pay for the full course, or pay for the first week in advance, if you are going to be paying weekly. Sign up today before all seats are full! We look forward to seeing you at our Tuesday or Saturday classes.